Today’s post is by Wahida Lakhani, an alum of my training program for Facebook ad consultants, the Ad Consultant Incubator. The results she got for one of her earliest clients were simply outstanding, and I asked her to share her strategy with you. 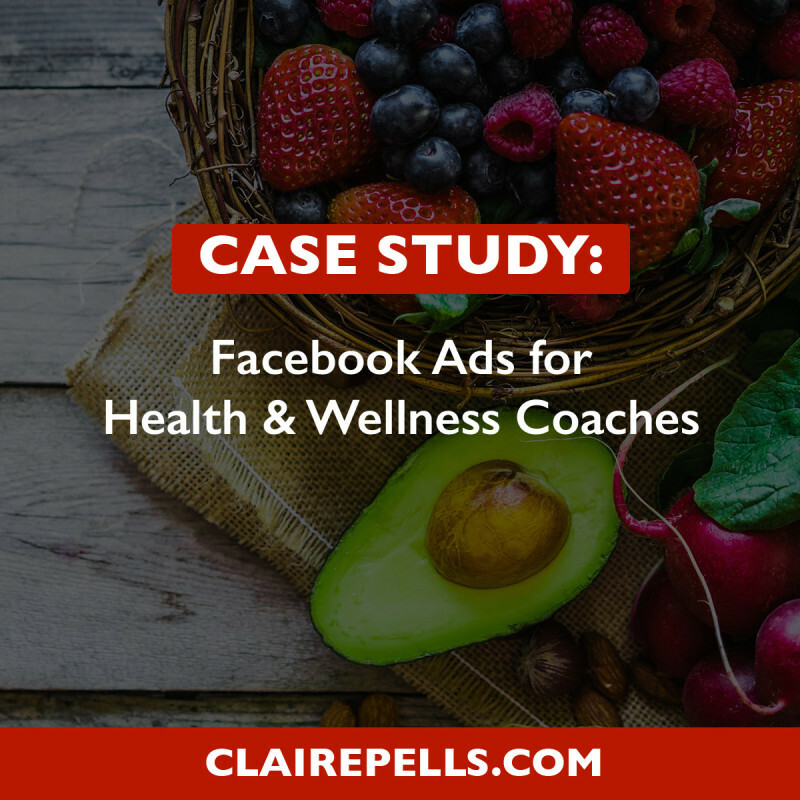 Kathleen was facing a common and frustrating roadblock: She was a successful wellness coach who had heard about leveraging the power of Facebook ads, but had been cautioned that she may be at risk of having her account shut down if she wasn’t careful. You see, Facebook had begun to roll-out stricter Facebook ads requirements and among them were rules around how you could and couldn’t talk about some of the benefits of health and wellness coaching… like losing weight. This didn’t mean that Facebook wouldn’t allow Kathleen to advertise at all, but it did mean that a successful campaign would require a creative approach. 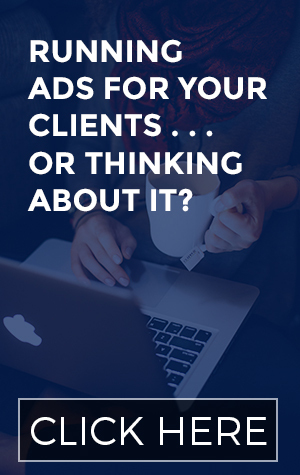 During the Ad Consultant Incubator, Claire referred Kathleen to me so that I could help her navigate this challenge and we were able to put together a truly successful campaign. In this post we will outline the approach we took to keep her account safe while generating piles of cheap, high-quality leads for as little as $10 a day. 1. A core goal for Facebook is to protect their user’s experience on their platform. Without happy, engaged users, Facebook doesn’t have a network and splat, there goes their business. As a result, Facebook has built-in precautions to favor high-quality, non-spammy content in both the organic content that shows up in the News Feed, but ALSO in the way they decide to serve up ads. That’s why ads that get positive engagement are rewarded by Facebook with lower costs and more exposure. So we knew that we wanted to lead with a really engaging ad to drive down our costs and earn the favor of Facebook. 2. We were pretty sure that we knew how to avoid getting dinged by Facebook after reading their guidelines, but we weren’t about to risk the client’s ad account. So our goal was to bring the right kind of users over to her website before we mentioned anything to do with weight-loss. We implemented a small tweak to the traditional lead generation campaigns that you often see on Facebook. 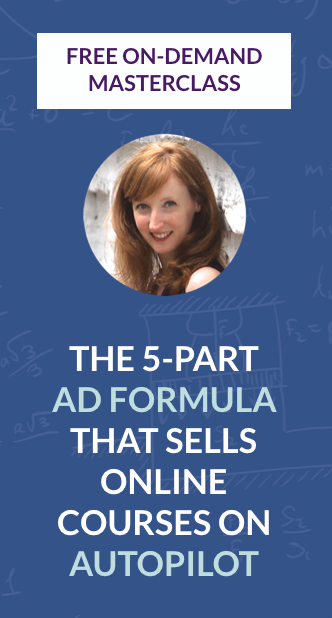 Instead of going straight from an ad to a gated opt-in, we added one extra step: a super high-value blog post where Kathleen gave away a great recipe and and all of the steps involved – for free. This solved both our problems, it allowed us to promote content that users and Facebook tend to love, and it also allowed us to drive targeted traffic to Kathleen’s website, where they could read the blog, join her list, but then also learn more about the benefits of wellness coaching (from weightloss to everything else) without getting our wrists slapped. 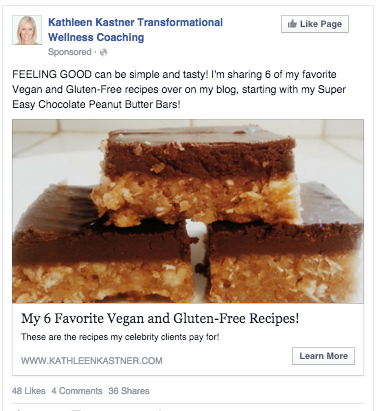 Step One: Kathleen wrote up an amazing recipe for Vegan, Gluten-Free chocolate peanut butter bars and we placed it on an un-gated blog post landing page. Step Two: Kathleen created an additional 5 Vegan and Gluten-Free recipes to offer as lead magnet on the blog page. Now, users who clicked through to see the Peanut Butter bar recipe could download another 5 recipes for free. Step Three: We created an appealing and eye-catching Facebook ad that promoted the free content to Facebook users, making sure to mention that the content we were offering was an ungated blog post. Step Four: We targeted people we knew were part of Kathleen’s ideal customer base. In particular, we targeted “Forks Over Knives” and a lookalike audience created from Kathleen’s existing email list with the filter of “Kris Carr”. The campaign took on a life of its own! Promoting the ungated blog content allowed us to achieve incredibly high link click-through rates of 5% (where 1% is usually considered satisfactory). Users who saw the ad started to share it with their friends on Facebook and as a result of the positive engagement, we achieved a 10/10 Relevance score which drove our cost per lead down to as low as $0.65 in some cases (where the industry standard for a simple lead generation campaign is usually ($2- $4). In a nutshell, we blew industry standards away, even in this difficult-to-navigate niche. After we were done, Kathleen was on her way to generate hundreds of high quality leads with as little as $10 a day. – Everybody loves great content. Try leading with ungated content that provides your ideal target with immense value. The likely result will be great engagement, high CTR and as a result a high Relevance Score. – Offer a lead magnet on the blog page that is tightly related to the ungated content and also has a high perceived value. 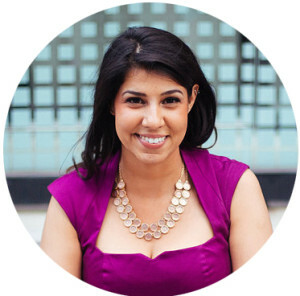 My name is Wahida Lakhani and I’m your lead gen maven. I am OBSESSED with helping you to put your lead generation process on autopilot, one system at a time. My “formal title” is Digital Strategist and I’ve been lucky enough to work with global Fortune 500 companies and well-known brands (whose products can probably be found in your home right now) to knock their social media and online marketing out of the park. Interested in working with me on your Facebook ad campaigns? Click here to check out my services.